Despite today’s dismal weather, my mind is still on the upcoming summer months and I really am a lady that likes to tan. Mostly faux but a little of the other too - with a super strength sunblock, naturally - and love any product that makes quick work of any of the above. 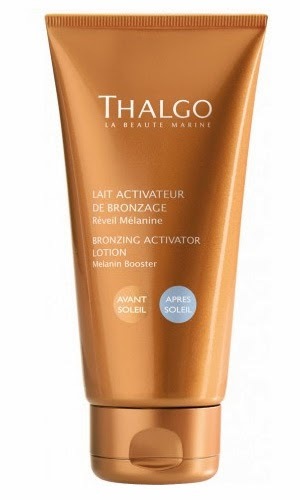 The latest new whizz bang number that I’ve laid my hands on is Thalgo’s Bronzing Activator Lotion, which “treats and prepares the skin and makes your tan last longer”. The clever clogs formula contains a melanin booster Insitol Derivative, a natural plant substance derived from the carob tree that activates, intensifies and prolongs a tan. It can be used pre-sun to minimise the time in the sun you need to achieve your perfect colour and can be used after sun to intensify and prolong a natural tan. I have been popping it on over the last week or so and spent some time in the sun this past weekend and was seriously impressed - the beginnings of a golden glow achieved relatively safely through my SPF45! It is designed to be used once or twice a day two weeks before sun exposure to accelerate your tan, as well as during and after sun exposure to intensify and prolong your natural glow. For a tanned complexion all year round, this super light cream-gel can be used on the face and body as a form of gradual tanner too, and the addition of some subtle iridescent pearls lends a rather sassy sheen after a day on the beach or by the pool. I’m totally in love with this little number, and given the seriousness with which the French approach tanning it’s no surprise that this cult beauty brand from France does it very, very well.